25mm Steering Upgrade Kit w/ Arms | Marlin Crawler, Inc.
Marlin Crawler has revolutionized the Toyota 4WD industry again, this time with the strongest 1979-85 Toyota steering pivot system in the world. Would you put your stock Toyota parts to this kind of abuse? Here our Tundra V8-powered test rig bashes its 42-inch Pitbull ROCKER tires into the ground, defiled by Marlin Crawler Competition Series parts! 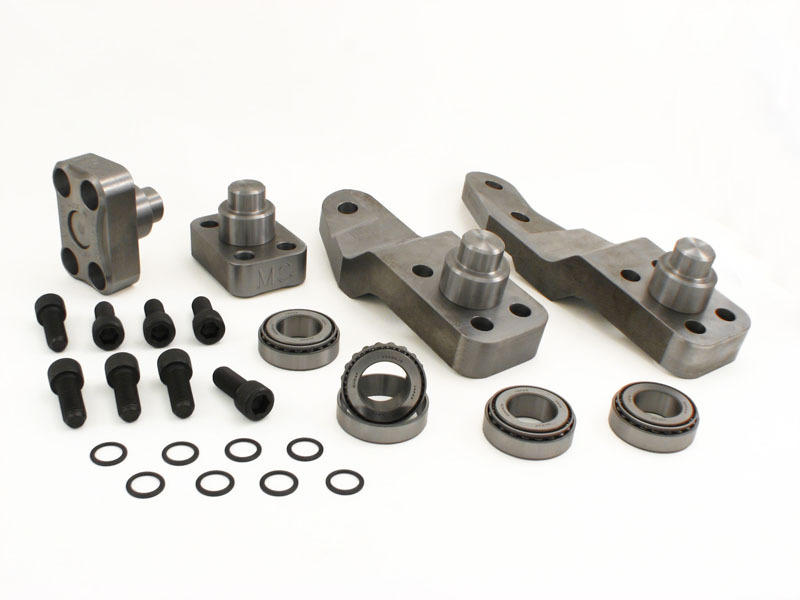 Kit includes everything needed to fully convert a 1979-85 Toyota front live axle to a competition series Marlin Crawler axle including our Billet HySteer arms, all parts made in America excluding Japanese bearings and German fasteners. Fully compatible with stock knuckles and axle housing, no modifications required. - If you already own a pair of Genuine Marlin Crawler Billet High Steer arms, then the pins are already compatible, and this full kit is not required. You may want to consider our Upgrade Kit instead. - This kit is not a High Steer kit and does not include any Marlinks. Please either view our Marlink Page or purchase a High Steer Kit plus a 25mm "Upgrade" Kit! When we sought to build Toyota pins as large as Dana 60 lower pins, we never knew the results would be this fantastic. The image to the left clearly shows the 116% larger cross-section of the High strength USA-made Chromoly 25mm Marlin Crawler Knuckle pin. By replacing your stock 17mm pins you are increasing the durability and also the safety of your Toyota-axle 4WD vehicle. Also of interest is that the stock component is a 1-piece cast setup whereas the Marlin Crawler component uses a Chromoly pin that is pressed into a solid billet cap, just like our High Steer arms. Here we have our new updated High-Capacity 8,500 pound-force 25mm KOYO knuckle bearing. The inner diameter literally dwarfs that of the stock NSK bearing. Can you believe that our KOYO bearing is 54% stronger than the stock Toyota bearing? You better believe it, baby! Not only is our pin 47% larger, but our bearing is also 54% stronger to boot! It is a total upgrade package! Knowing that no steering linkage is attached to the lower cap, designing stronger fasteners wasn't a high priority of this upgrade kit. But then again this kit is designed by Marlin and he only wants the best parts for your rig! Without compromise, the kit includes high shear and high tensile strength 12.9 grade cap bolts along with high quality serrated conical lock washers made in Germany. The great thing about this design is that unlike factory studs our bolts do not have shoulders. Therefore our bolts contact 100% of the knuckle's threads providing a high clamping force without fear of damaging knuckle threads. Our lower bolts can be torqued to 65 ft-lbs, which is nearly three times the recommended rating of the stock studs. All Billet Steel parts along with their 25mm Chromoly pins are all made in the USA. As you can see on the lower caps, we are quite proud of USA made parts! All of our steering arms and lower caps use a 78% larger 1-inch diameter pin-to-arm connection, which is the largest and strongest pin-to-arm connection on the market. Another impressive feature of our Billet Rock Guard lower cap is how much ground clearance is gained. As shown to the left, ground clearance is cut by a massive 60%. Put yourself in a rocks shoe: Would you rather hit an exposed single stud or go face-to-face with our Solid Billet Rock Guard lower cap? Stop risking bent studs with damaged delicate and exposed threads. 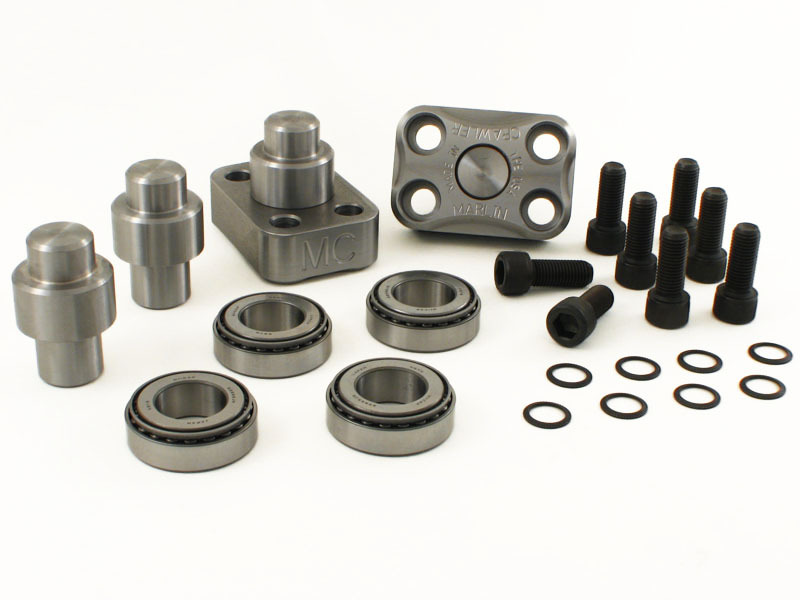 Switch over to our Heavy Duty Knuckle Bearing Upgrade today! fully tested Marlin Crawler Knuckle Upgrade Kit! Also available as a complete upgrade kit including our Billet High Steer Arms, as pictured below.